With the price of electricity going through the roof, more and more people are turning to wood burning systems to heat their homes. While cheaper than either electricity or oil, it also poses a greater risk of fire. If you currently heat your home (completely or partially) with wood, it is in your best interest to have your system inspected by a Wood Energy Technical Transfer (WETT) specialist. Q. How do I get a WETT inspection or WETT certificate? A: There is no such thing as a WETT inspection, nor can any appliance be “WETT” certified. What is issued is an inspection report by someone who is a WETT certified technician. There are 3 levels of inspection. Level 1 ( Site Basic ) is typically for insurance company requirements. I frequently get requests for a “WETT Certificate,” a “WETT Certification,” a “WETT Approval” or they ask if it’s a “WETT Certified installation.” I also get requests if my company is “WETT Certified.” All of which are incorrect. As a WETT Certified Technician I will inspect your wood burning appliance and issue with an Inspection Report based on the type of WETT Inspection you require. There are no legal requirements in Canada for a person to be WETT certified in order to perform inspections. However, many insurance companies are insisting that the inspection and/or installation and/or maintenance of wood-burning appliances and equipment be performed by someone who is WETT certified. The installation and maintenance of wood burning appliances is not regulated in Canada. WETT certification implies that the inspector has met the educational and experience requirements required by Wood Energy Technology Transfer Inc. a non-profit training organization. Wood Energy Technology Transfer (WETT) requires an individual to take 3 courses and obtain a passing grade of at least 70% in each. Regulatory Structure and Function – Use of documents such as Ontario Building Code, Fire Code, Municipal Bylaws, and Product Safety Standards. Identify which agencies Test and Certify wood burning equipment. Inspection Issues – Check Clearances, floor protection and venting arrangement. 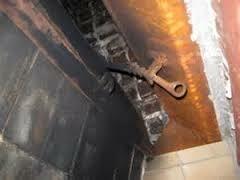 Difficulty of Inspection – as can be seen in picture to the left, fireplace construction is difficult to inspect and often defects in construction are not visible. Most masonry fireplaces are inspected during construction by building department inspectors who are responsible to ensure proper construction methods are used. This WETT Certification course starts out with case studies involving potential situations you could encounter as a Certified WETT Inspection provider regarding type and placement of wood heating appliance. Clearances and clearance reduction in accordance with B365-01 are discussed. Sample space heater inspection forms are filled out using sample information. Chimney height requirements for different locations are discussed to ensure adequate draft for unit. Flue installation and thimble installation are also covered. There are many more items regarding different type of installs and also included is requirements for flue collars and flue pipes. Site Basic Inspection – Level 1 is described a ( Readily Accessible ) “Readily Accessible” means quickly or easily reached for inspection. A Level 1 inspection does not require the use of special tools for opening or removal of any panel, door or other covering; not does it require the use of ladders. It does not require the disassembly of system components. A tape measure, light, mirror, camera, magnifying glass and binoculars comprise the usual tools required to perform this inspection. Creosote is the by-product of incomplete combustion of any fossil fuel such as wood, oil, or coal. When the build up is more than 1/8th of an inch thick it should be removed to avoid possibility of a fire within the chimney. There are three different forms of creosote: granular deposit, brittle puffy, and third degree hard slag. The form of creosote in any system is dependent upon appliance efficiency, ambient temperature of chimney liner, improper operating techniques, and condensation…or a combination of all four. When creosote reaches the brittle or third degree form the possibility of it igniting becomes very high; upon ignition it can cause very severe damage to the chimney and any surrounding structure since it could burn in excess of 3000 degrees. How hot is 3000 degrees? It’s hot enough to make the flue pipe look like a stove element! Some chimney fires have been described as sounding like a jet plane or train going through the house. The purpose of a chimney is to effectively exhaust smoke and its by-products out of the living quarters not contain a fire and the extreme temperatures it produces! Creosote is not your friend! Q: How long is a WETT inspection report valid for? A: The nature of any inspection report is that it records what was seen at the time of the inspection. After completing an inspection report and leaving the premises, the inspector has no control over, nor knowledge of, any changes that may take place on a wood-burning appliance installation. Consequently, an inspection report can only warrant what was seen and recorded at the time of the inspection. Q: How much does a WETT inspection cost? Q: How long does a WETT inspection take? A: Most WETT inspections can be done within an hour with written report given to you at the end of the inspection. Call Roger today to book your WETT Certified Inspection.